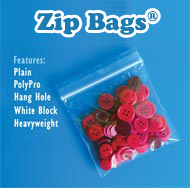 Zip Bags Recloseable plastic bags. Many sizes and styles are available. Open Poly Bags Open on one end. Lots of sizes and several thicknesses available. Bubble Packaging Padded envelopes, Bubble Wrap® and more. Shipping Supplies Shipping tape, tape dispensers and more. 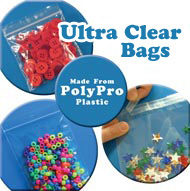 Ultra Clear Bags Ultra clear cellophane bags - zip, lip & tape, protective sleeves.